My baby girl turned 6 last week. For months she had been requesting breakfast at Bob Evans for her birthday. I don’t encourage her to set her dining sights too high in our one horse town. She got all gussied up, wearing a new dress that her Nana had just made. For her sister. So it was a little roomy, but had excellent twirling capabilities. Besides, if you’re going to enjoy the fine dining experience of Bob Evans, it’s best to wear clothes that have a little “give.” Personally, I find that stretchypants work best for me. We were suppose to have her “Mermaid” party that afternoon, but alas, that morning we discovered that 6 of our 8 cousin party guests were unable to make it. So, because we’re flexible, and I was frankly relieved to postpone it, we rescheduled for Sunday afternoon. At last Sunday arrived. I spread tarps all over the backyard. And set a large ring sprinkler in the middle. In essence, forming a lagoon. By the way, spreading large blue tarps all over your lawn hides a multitude of landscaping sins. I also had a largish baby pool filled with water, and a slide stationed to deposit slippery party goers into it. There were water balloons, and a finger painting station. I served a mermaid cake and ice cream cones. All in the lagoon. So the guests could be hosed down afterward. One of my most brilliant moments, I know. Other than a little rain, which no one really noticed, since the adults enjoyed the fact that their clothes were sticking to them because of the balmy conditions here in Armpit, Florida, the party was a huge success. “THIS IS THE BEST PARTY I’VE EVER HAD!” exclaimed my Cailey. I neglected to tell her that it’s the ONLY party she’s ever had. So, comparatively speaking, it really ranked way up there on the party chart. We start getting all festive with the birthday party business, after the 3rd birthday or so. And unfortunately for Cailey, Jensen came along right about then and life came to a grinding halt. But no more. We’re fast becoming party animals. In fact, I’m planning a party for Emme who will turn 8 next weekend. Since I survived this one. Mostly intact. I have memories as a child of my mother giving me simple, but wonderful, backyard neighborhood birthday parties. There were games, snacks, and a gorgeous hand baked birthday cake. And my mother always looked spectacular with her 60’s bouffant hair, fashionable capris, and slings. I have the home movies to prove it. I don’t know how she did it. And my parties were always in August. My daughter will have home movies of her mother with frizzy (not even my Chi could help me today) hair. The parts of my hair that weren’t sticking straight out were plastered to my pointy head from sweat and wayward water balloons. My mascara was running, and I was soaked from head to toe. The grotto may have been my downfall. 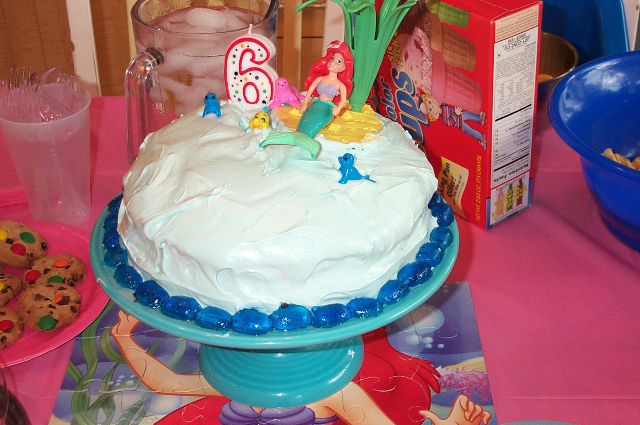 But my baby girl mermaid had a 6th birthday party that she will always remember. And that’s what counts. Wednesday night was date night with my girls. We attended AWANA while Fiddledaddy spent a little bonding time with the boy. Much to Jensen’s delight. When Jensen was born, I thought I’d finally have a child that worships the linoleum I walk on. As far as Jensen is concerned, the sun rises and sets on Daddy. As though he senses the balance of testosterone and estrogen in the house is askew. Even the death of Katie the Cat left the house still hormonally unbalanced. And with the onset of pre-menopause, well, the testosterone carriers in the house cling together. Afraid for their very lives. By the time we girls pulled into the driveway, Fiddledaddy had put Jensen blissfully to bed. One down. Two to go. Just as we were preparing to enter the front door, we noticed a number of frogs on our front porch. Everything from small green ones to large fat bulbous amphibians. A plague, as it were. As Fiddledaddy opened the door, the commotion began, in domino effect. Emme shrieked, catching a small frog attached to the door. And thusly flinging it to the middle child. Who screamed. Then a large well fed toad attempted to hop into the house. Fiddledaddy scooted him out with his foot. At this point, Emme thought it would be sporting to stomp on this hapless frog. While wearing her crocs. The frog began hopping for his life, heading right for the middle sister and the mother, as she continued stomping. Have I mentioned the mother is deathly afraid of frogs? For no apparent reason. From all the shrieking and screaming, the neighbors must have locked their doors and pulled down their collective shades in an effort to avoid the home invasion robbery that was surely occurring next door. Somehow the frog escaped certain death from squishing, and we made it in the door. Breathless. But not without waking the sleeping baby brother. Since the majority of the noise came from me, I felt obligated to go to him to comfort him back to sleep. When I entered his room, the crying ceased, and he looked up at me with tired red eyes. “Mama rock,” he stated. “Mama rock,” I agreed. We settled into the old faithful rocking chair. My baby boy laid his sweet head on my shoulder. After a few moments, he looked up at me and whispered, “Mama home?” “Mama home,” I reported. He smiled and sighed contentedly, “Mama home,” and he lay his head back on my shoulder. His breathing matching my own. And for that sweet moment, he was a mama’s boy. The dinner conversation took a wrong turn toward body functions. It usually does if we all sit there long enough. A lively banter involving poop ensued. I’ve spent years fighting this phenomenon. Trying to instill a little decency and class into the evening meal. To no avail. Makes you want to join us for dinner, doesn’t it? The topic came to rest while discussing Jensen’s diapers. Suffice it say that he’s a healthy specimen of boy. I’ll spare you the gory details. I chuckle under my breath. Servant indeed. As if. I look up to find her gazing at me. She shrugs her small shoulders and continues eating. What remains unstated is that I fully plan on living with each one of my children when I’m long past coherent and continent. And then we’ll see who changes who’s diapers. Circle of life and all that rot. During the next few weeks, we’re covering a Unit Study on Space here in the Fiddle Academy of Higher Learning. Recently we ventured out to the Kennedy Space Center for a family field trip, and today we viewed a tape of how the astronauts train for their missions. As a child, I loved shows like “Lost In Space” and “Star Trek.” I am completely fascinated by the Space Station. I tune into the NASA channel often to catch of glimpse of life on the Space Station. It could be a series as far as I’m concerned. “As The World Turns.” But, that one is taken. Pity. My heart leapt with joy. For a couple of reasons. This is a child who, for the last few years, has aspired only to be a fairy. Or a mermaid. Granted, she’s only 5, but it’s never too early to start thinking about career choices. And this is the first I’ve heard her acquiesce to the fact that one day she will, indeed, grow up. And get a job. The movie continued. The Challenger disaster was covered as well. The sober silence that filled the room was shattered when Emme nearly yelled, “THEY DIED?” At the same time she grabbed the remote to replay it. Not twice. But three times. “Cailey, that is very very rare. I think you would make a wonderful astronaut. Look, they get to wear orange. You love orange.” I was trying to think fast, before she changed her major. “Emme, you don’t have to, you could work at Mission Control!” I offer brightly. Pffffttttt. My dreams go up in smoke. There’s still time, I assure him. I mean, look at me. I wanted to be “Miss America” when I grew up. Suddenly, Disney World isn’t looking so bad. What did you want to grow up to become? I’ve begun a new exercise regime. Y’all are going to be so proud of me. I started with weight training, and have worked my way up to 40 lbs. I began with approximately a 7.7 pound weight, and it has grown to 40 pounds in less than 2.5 years. Every time I lift that weight in/out of the crib, high chair, car seat, and off the chandelier, I am building muscle. Next I took up Karate. Unwittingly. Emme is in a Karate class with her homeschool co-op, and I am a volunteer parent. The karate instructor encourages the volunteer moms to participate. And since I’m certain she could kick my sagging derriere from here to next week, I comply. So, I stretch, kick, punch, lunge and perform intricate karate moves with the rest of the class. Even though I have at least 35 years on them. I’m fast becoming a weapon of my own mass destruction. For endurance, I thought I’d try running. Without the added incentive of being chased. After our co-op of classes, we all head to the playground for some of that all-important socialization. We moms need a little adult conversation every now and again. Only, I’m never able to complete a thought. Much less a sentence. I’m too busy doing the 50 yard dash to stop a runaway freight train named Jensen from playing with the “real” cars in the busy parking lot. Or sprinting across the playground when Jensen spied his sister swinging high up in the air on the swing and he decided he’d like hug from her. Mid-swing. I yelled like a mad woman to get her to come to a full and complete stop while at the same time tackling Junior just inches from a sure collision. And people, I should never run in public. I have the most uncoordinated run known to man. Or woman. I resemble a broken windmill, arms and legs heading in all different directions. If you ever saw the episode of “Friends” where Phoebe tries to run, well, then you get the picture. And it isn’t pretty. That afternoon, just for grins, I popped my abs tape into the VCR machine. Because I’m technologically ahead of my time. It’s from the early 90’s, I believe. The fashion of the day was headbands and leg warmers. But, a sit-up is a sit-up. My girls even joined me on the floor, while Junior scurried around near by. At one point, mid-cruch, I looked to my left and no sooner were the words, “Where is Jensen?” out of my mouth, when he surprised me with a full body slam from my right. Completely knocking the wind out of me. And then, on Tuesday we joined Sports Camp. It’s for homeschoolers to earn their President’s Physical Fitness Award, and learn a new sport every month. AND, here’s the fun part, THE MOMS ARE ENCOURAGED TO PARTICIPATE! So, the next time Fiddledaddy suggests, “Why don’t you just exercise?” I’m going to karate chop him in the adams apple. And then run like a bat out of a hot place. Warning: If you’re even a little bit squeamish, don’t read this post. FOR THE LOVE OF ALL THAT IS GOOD, move on. Save yourself! And your sensibilities. I debated telling this story. I wrestled with it for about 10 minutes. But, since I’m all about full disclosure regarding my parenting experiences, I couldn’t help myself. And the fact that I’m juvenile doesn’t help. With that said, hold onto your Oreos. Last night I was giving Jensen his bath. It’s a gleeful time for him. He dearly loves his nightly bath. He shares the tub with his beloved Wheel Pals cars. Since the Hotwheels don’t fare well, what with all the rusting they endure after submersion. The bath is also the only location that I am able to feed Junior without a fight. Sadly. I was sitting on the toilet (lid down) beside the tub, feeding Jensen his chicken dogs. Cut to bite-sized non-choking-hazard pieces. Emme and Cailey even provided the entertainment by bringing their guitars into the bathroom to play “Mary Had A Little Lamb” that they had just learned in their guitar class. It was a happy, albeit crowded, moment. Jensen got up on his haunches and leaned forward, I presumed to be closer to the source of the sweet music. With no warning whatsoever, Jensen shot out the largest poop I’ve ever seen come out a child. It was the size of his entire leg. I wish I were kidding. And it just lay there, fully intact, on the bottom of the tub. Jensen stood up, to get as far away from it as possible. With wild banging of guitars against walls, sibling, and door, the sisters made a hasty retreat out of the bathroom. I wanted desperately to follow them. But I couldn’t. What kind of mother would I be. Immobilized, Jensen and I stared at one another for about a minute. Then I did what any mother would do. I called for Fiddledaddy. He came quickly when he heard the urgency of my voice. He assessed the situation. “Dude!” He said as he lifted Jensen out of the tub and whisked him away to the other bathroom. Which was a brilliant move, by the way. Since I was left to handle the excrement. I wondered if he noticed that the child was two pounds lighter. I stared at the tub for another minute or so. “I can’t just let the water out,” I reasoned. That would have caused a whole other set of problems. I noticed the chicken dogs, still sitting on the counter. Suddenly, I didn’t feel so well. I left the bathroom, my mind racing. I could just close the door and pretend it never happened. A favorite coping skill of mine. I went to the kitchen to get a plastic bag. Reluctantly, I reentered the bathroom. I began gagging. I opened the seat of the toilet, just in case. It was then that I realized that I hadn’t cleaned this particular toilet this week. An unfortunate mishandling of housekeeping duties. Soon, I was heaving like a dog. Tears flying from my eyes. I put my hands into the plastic bag, trying to provide a barrier between me and the offending feces. People, it took two hands to lift it out and deposit it into the toilet. I flushed. Thankfully it went down. I thought I would have to dice it up first. Then I had to go after the remaining debris. A most unpleasant task. I was retching the entire time. I think the only reason I was able to mentally talk myself out of hurling, was that the only person in this house who would clean THAT mess up, would be me. And I instinctively knew that if I had to clean it up, more would be forthcoming. And, well, I just willed myself not to blow. Let it be noted that I have more will power than I give myself credit for. 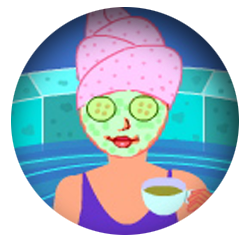 I finished up the job by disinfecting the bathtub, wheel pal cars, and my hands and arms, right up to the pits. I don’t know what happened to me. I thought I had developed a high gross-out threshold after birthing three children. I mean, even his diapers don’t bother me. And that’s sayin’ something. Oh well. It coulda’ been worse, I suppose. The incident could have occurred in my bathtub. Then I would be relegated to taking showers from now on. I remember when I was very young, spending summers at the community pool. There were a couple of boys who delighted in torturing the swimmers by strategically placing Baby Ruth candy bars in the water. I use to think that was hysterical. I will never eat another Baby Ruth again. They are dead to me.